These are soooooo quick and simple to make. They make great gifts for teachers or work colleagues at Christmas time, and are also a nice little thought for a sick friend, or someone who is going on a holiday! Two cotton fabrics and matching thread. First of all, cut a rectangle that measure 5 ½ “ x 6 ½ “ from the fabric that you have chosen for the outside of your tissue cover. Now, cut a second rectangle of fabric measuring 5 ½ “ x 7 ½ “ for the lining fabric (this fabric is also seen on the edges of the opening, so it’s nice to choose a fabric that co-ordinates well with your cover fabric). Place the fabrics right side together, and sew a ¼” seam down both the, 5 ½” sides. As the lining fabric is larger than the outside over fabric, the piece that you have sewn won’t sit flat – THAT’S OKAY!! It means you’re doing it right! Turn the fabric piece right side out, and press, so that you have approximately ¼” of the lining fabric showing at the sides (just like in this photo). Now, fold the edges towards the centre (you should be looking at the lining fabric). Stitch a seam along both short ends. Now, turn your cover inside out. 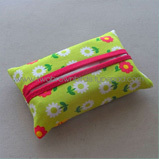 Take the plastic wrapper off your travel tissues, and slip them inside your beautiful new fabric cover! Voila! These are so quick and simple, I bet you can’t stop at one!